Use a faux calligraphy technique to create a Shakespeare inspired quote art for your craft space. Nothing like the Bard to keep you motivated! This month marks the 400th anniversary of Shakespeares death. Now I love a bit of Shakespeare, it may not be bedtime reading, but there is something about the poetic writing and the worlds he creates that have always fascinated me. Who else remembers going to see the Baz Luhrmann film ‘Romeo and Juliet’ in 1996? I don’t know about you, but it changed the way I saw Shakespeare. I have since been to a couple of outdoor performances and was lucky to have watched the late Richard Briers in The Tempest. So when Viking sent me an email asking if I would like to make a Shakespeare themed DIY craft project with some of their new craft materials, it was a definite yes. 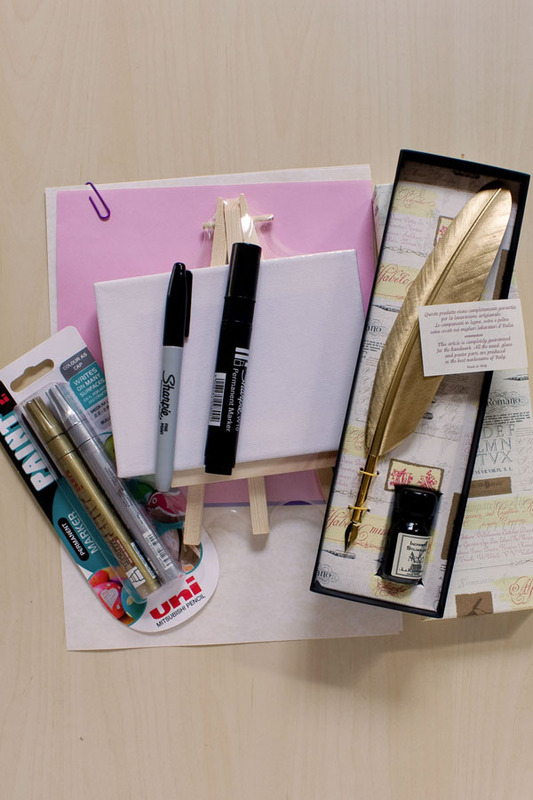 They sent me a lovely box of goodies, containing a canvas and mini easel, papers, Sharpies and paint pens and a gorgeous feather calligraphy pen. Now I have to admit, I cheated slightly. 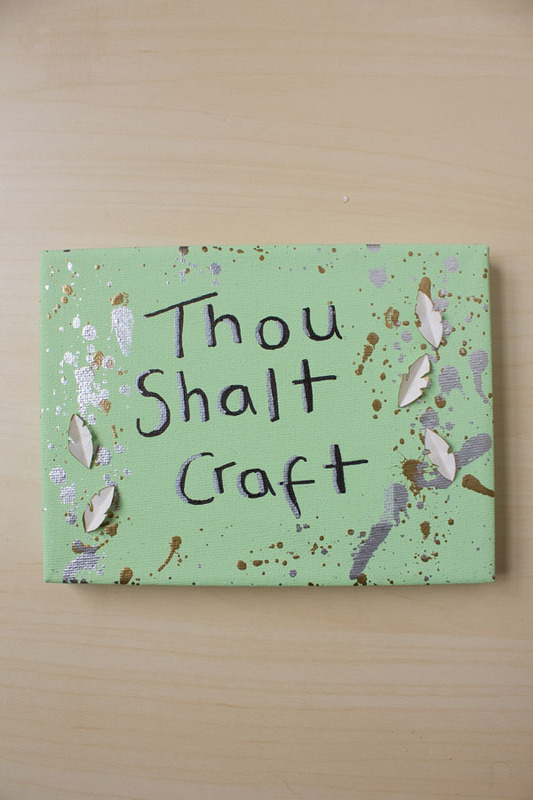 The brief was to create something using my favourite Shakespeare quote, but I couldn’t get their tagline of “Thou Shalt Craft” out of my head as it seemed very appropriate, so I went with that! 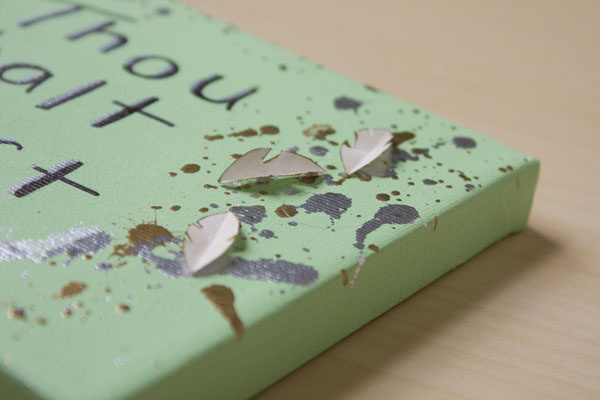 And I was also tempted to just glue the feather pen to the canvas as it is so beautiful, but I refrained. Now I would LOVE to use that calligraphy pen, but I tried and well, it looked like a drunken spider had wandered over the paper. More practice needed I think! So I went back to my beloved Sharpies and made my own fake calligraphy, or ‘faux-ligraphy’ if you will. 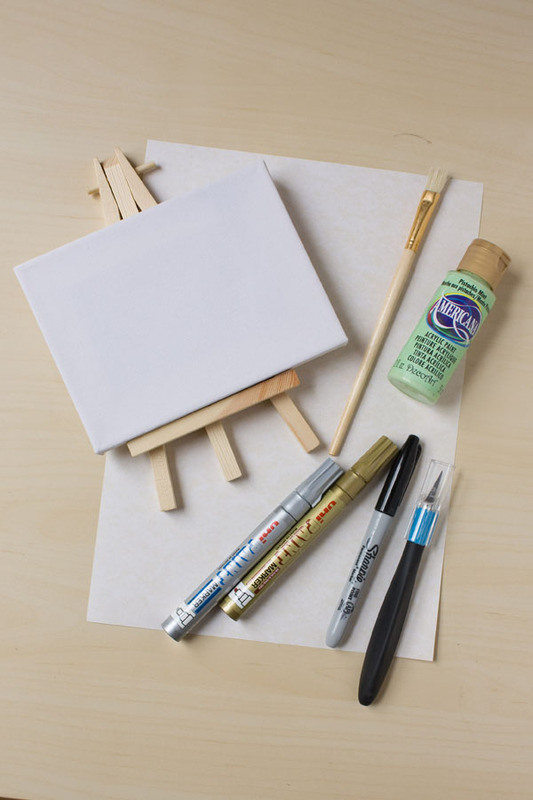 1.Paint your canvas with a layer of acrylic paint and leave to dry. 2.Using your fine point Sharpie, write your quote in simple, well spaced letters onto the canvas. Now to make the lettering look a bit more interesting. 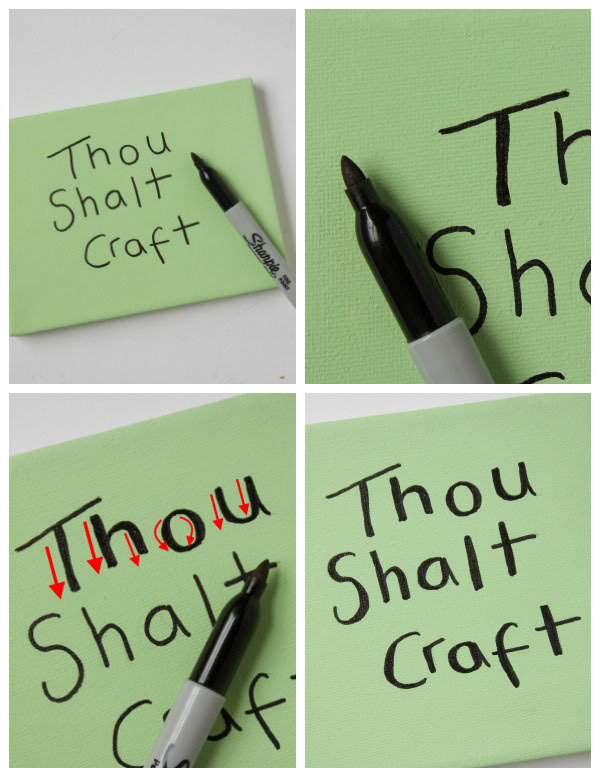 Using the same Sharpie, make all the downward strokes (basically, all the vertical or near vertical lines) thicker on the left hand side. For letters with straight lines like ‘T’ this is fairly simple, for the curvier letters, like ‘O’ make the line thicker on the outside of the left and inside on the left, as indicated by the red arrows. The only letter this doesn’t work for is the ‘S’ where I added on the top right curve then bottom left. 3.Now its going to get a bit messy, so make sure both you and the surface your are working on are well covered. 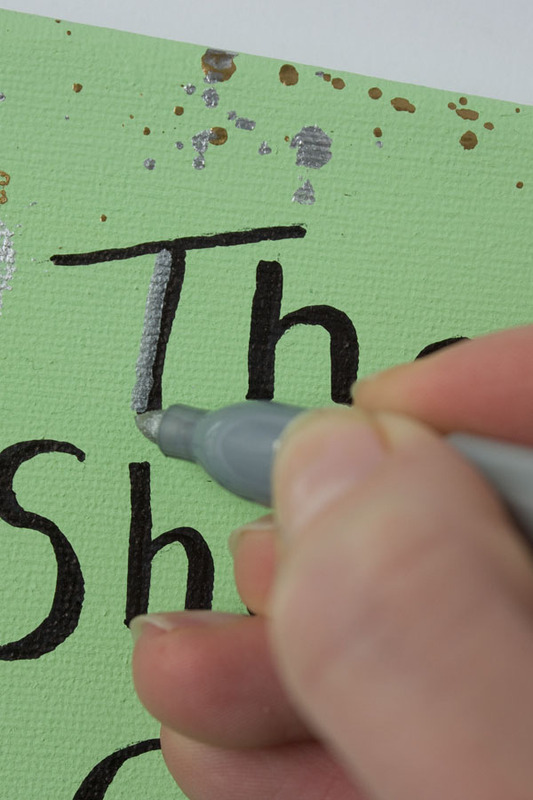 Cover up the text with a piece of scrap paper, then prime your silver paint pen by shaking then pressing on the tip a few time to get the paint flowing. Then rather than drawing we are going to flick the pen, splattering the canvas with paint! Fun eh? 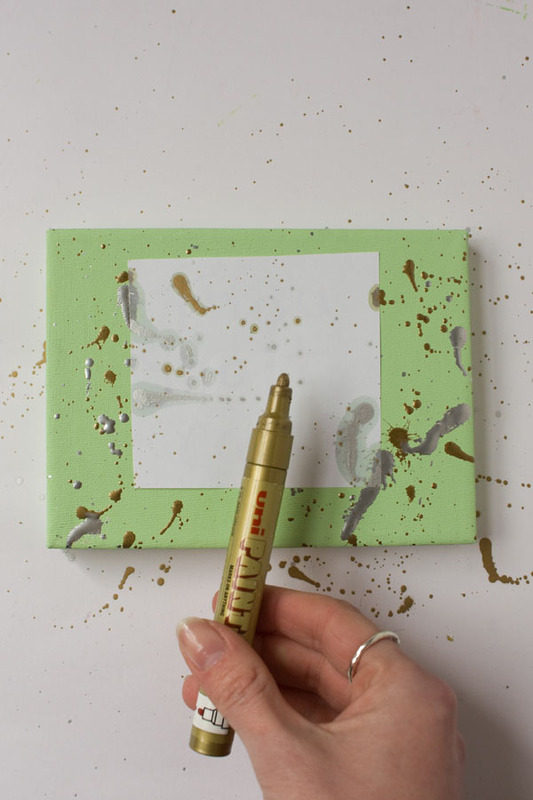 Repeat with the gold pen, remove the scrap paper covering the letting, then leave to dry. 4.Now I decided that my lettering could do with something else, so grabbed a silver metallic Sharpie and added some highlights, in a similar way to step 2. 5.I was inspired by the feather calligraphy pen, so decided to create some paper feather embellishments from the parchment style paper. Fold the edge of the paper over and draw curved lines. 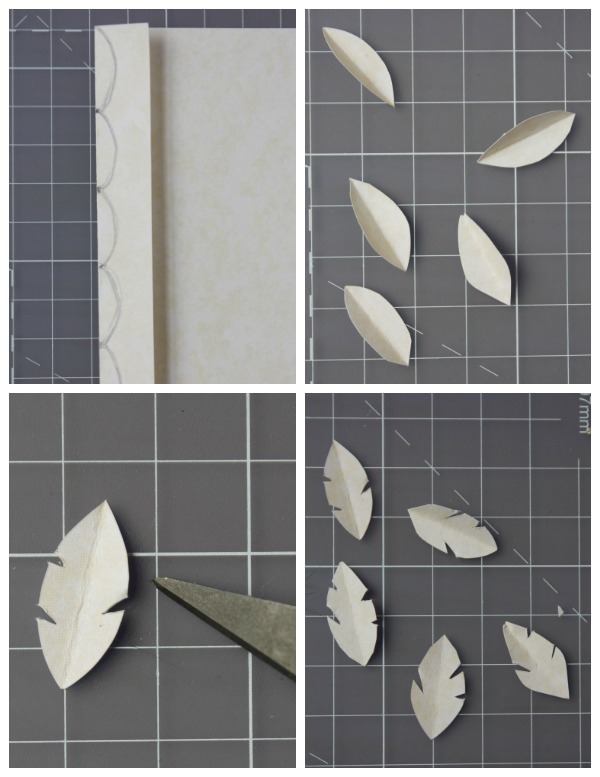 Cut out each shape, then use a craft knife to take notches out of the sides. I also chose to add some gold paint marker to the edges. 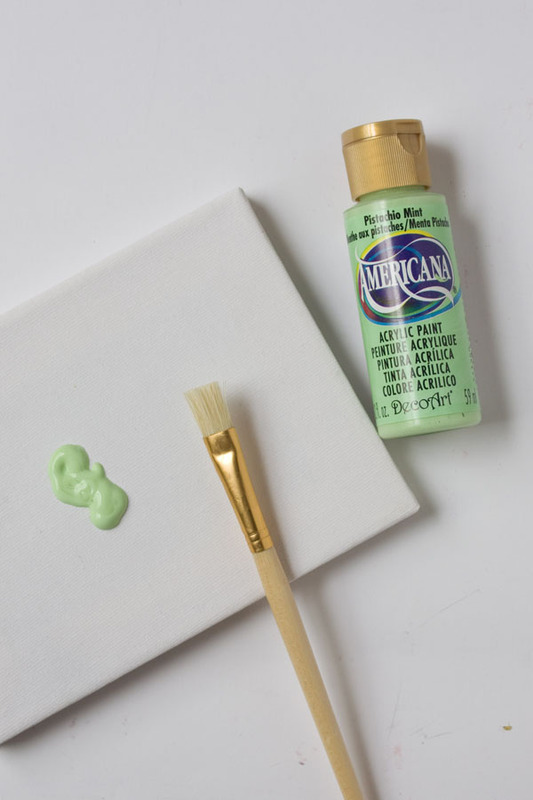 6.Use your glue gun to stick the feathers to canvas. Press down only enough to ensure they stick, but without flattening them. If you have a go at making your own Shakespeare inspired quote art, or have any questions feel free to comment below or message me on Twitter, Instagram or Facebook! Happy Making!